The Novel Bookworm: Giveaway!! A book a day in the month of May!!! Day 17!! Giveaway!! A book a day in the month of May!!! Day 17!! 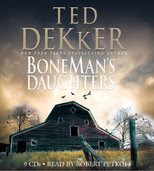 Today's giveaway is an audiobook Boneman's Daughters by Ted Dekker. I'm a big Ted Dekker fan, so I'm really excited about giving this one away! Returning home after the ordeal, a new crisis awaits. A serial killer is on the loose, and his method of killing is the same. Ryan becomes a prime suspect, which isn't even the worst of his problems: Ryan's daughter is BoneMan's latest desire. In a story that is devaststing in its skill and suspense, - Ted Dekker brings to bear his ability to terrify and compel in BONEMAN'S DAUGHTERS. This is a wonderfully creepy book, I read the book the old fashioned way, but if you're wondering about audiobooks, this book would be a great first one for you, and if you're already a fan, this book is a must have! This giveaway ends on May 24th, when I'll draw 5 names and send them on their way!! (US and Canada only please, and no PO boxes, sorry!) And don't forget to scroll down and check out the other giveaways! Or you can find a list of all of them by clicking HERE! This book looks good! Thank you for the chance to win it! I have never listened to an audio book so this would be great! Instead of creeping myself out by reading, I can do it by listening. Please enter me. I love da creepy books. LOL. Seriously. I've heard of this author. Looks good. I'm going on a LONG road trip in a few wks and this would be perfect to take. Especially since we'll be driving during the day. Sounds quite scary for night time!!! my roommate made me aware of your blog/site. we both read so we love the Internet. all of us bookworms now have a gathering place. Yes I'd love to read this book. Count me in. I haven't read anything by this author but my interest is piqued. Merci. Would love to have this to listen to as I commute! I'd love to be entered! And I have been a follower for some time now. Heard alot about this author and I am interested. Please enter me. I have heard alot about this book and would love to read this. Please enter me, I would love to read something besides a text book. WOW! I would love to win this, it sounds amazing! Thanks so much for the contest! forgot to post my email address. I like creepy reads. Thanks for the chance to win. I think several members of my family would enjoy this. I have never "read" an audio book so this would be great! I love a good horror story. Hope that I win. Then I'll pass the book on. Wow, I'm tense just reading the summary. Sounds good. I'd love this & I am a follower-thanks!